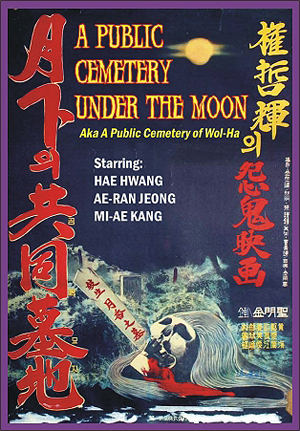 (1967) Hae Hwang, Ae-ran Jeong, Mi-ae Kang, Do Kum-Bong, No-shik Park. This Asian chiller has all kinds of grisly stuff: Acid thrown in the face, eyes being gouged out, the horror of drug addition, vengeful ghosts, etc. The plot is pretty simple, a former geisha girl takes her life because she’s essentially lost her husband to the wanton lure of a servant girl. But like in any good Asian ghost story, revenge is a must! So she soon returns from the grave to take vengeance on the woman who stole her husband and is now trying to kill her son. There’s some very cool, heavy-duty supernatural stuff in this film, and the lighting in places reminds you of a Mario Bava movie. Watch for the cool scene where the ghost’s grave splits in two. Aka A Public Cemetery of Wol-Ha. With English subtitles. Great color, widescreen, 35mm.